May 2018 www.coalage.com 31 clean coal conversion continued The quality of the foundry-size coke is similar and/or exceeds the specifications of conventional coke used by the foundry industry. The analytical quality of the Vir- ginia briquetted coke being supplied to the U.S. foundry industry is shown in Table 2. These data shown in Table 2 meet all the existing specifications for the U.S. foundry industry. Several important ob- servations are note-worthy in that the foundry-size coke briquettes as shown in Figure 8 illustrate that all the formed coke briquettes are the same similar size, which has shown improved air flow through the coke bed in the cupola furnaces with im- proved efficiency and production. In ad- dition, the coke density of the briquetted foundry coke as shown in Table 2 is about 20% higher than conventional foundry coke, which also results in higher pro- duction rates per ton of coke through the cupola furnaces. Also, the hardness of the coke briquettes results in a higher drop shatter index of 96%-plus existing on a 2-in. screen, which illustrates less coke breakage over conventional foundry coke during shipping and handling. 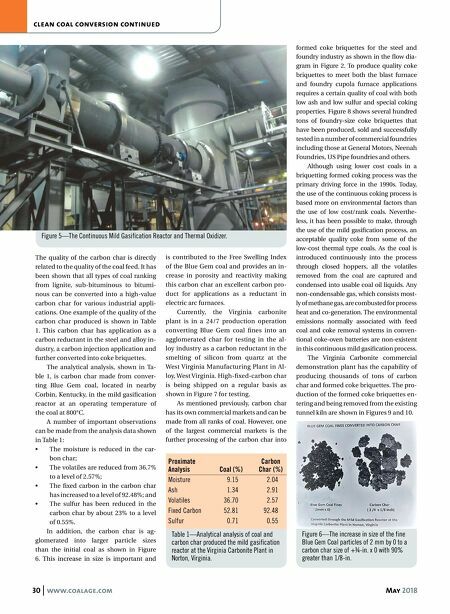 Large quantities of formed furnace-size coke briquettes have been produced, but to conduct a blast furnace test would require a quantity of coke of 40,000-50,000 tons, which is more than the initial capacity of the commercial demonstration plant. The quality of the coke for the blast fur- nace industry requires a much higher qual- ity of coal than for the foundry industry in both coal strength after reaction (CSR) and the coke reactivity index (CRI). And typi- cal furnace-type coke is on the size of 3 in. x 4 in. and not as a big in size as required by the foundry industry. Figure 11 shows a photograph of coke briquettes made of the quality required in the blast furnaces. These formed coke briquettes measure 3 in. x 4 in.- x 2 in. thick in the center. One thing is for sure, in the briquetting of both foundry and blast furnace coke, the size of the briquetted molds can be changed to meet the customer's needs. These coke briquettes were calcined in a tunnel kiln with the cal- cination temperature in the 1,100°C range for a period of less than 4 hours with similar operational parameters as in the produc- tion of foundry-size coke briquettes. These furnace-coke briquettes were analyzed and compared with conventional-furnace coke made commercially in the U.S. and shown in Table 3. From these data, it is clear that the briquetted coke made in the CTC mild gasifi- cation process were similar and/or exceeded the quality of conventional coke made com- mercially in coke-oven batteries like those operated today around the world. These coke briquettes were analyzed and compared to the quality of conven- tional coke made commercially in coke Figure 7—Carbon char briquettes are loaded for transport. 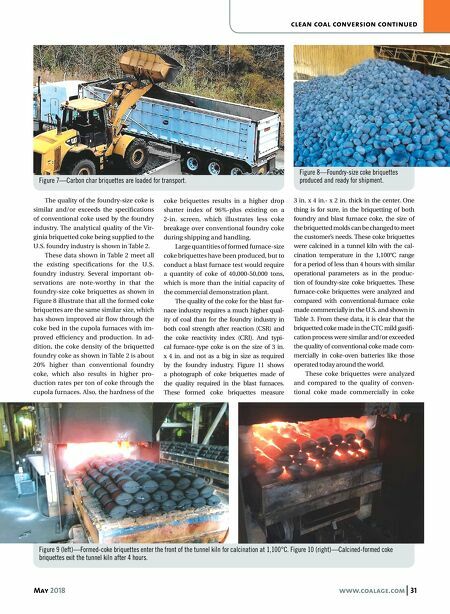 Figure 8—Foundry-size coke briquettes produced and ready for shipment. Figure 9 (left)—Formed-coke briquettes enter the front of the tunnel kiln for calcination at 1,100°C. Figure 10 (right)—Calcined-formed coke briquettes exit the tunnel kiln after 4 hours.